This is something I've been wanting to make for a long time, but have shied away from because of the whopping calorie content. But in a fit of pre-diet carb-loading, I decided it was now or never. It was either this or Churros y Chocolat from Thomasina Miers Mexican Food Made Easy. This only won because I'm still a bit of a wuss when it comes to deep-fat-frying without a deep-fat-fryer. As with all James' recipes, this involves an awful lot of butter, and lots of sugar too. But it has fruit in it, so I figured it counts as one of my five a day. 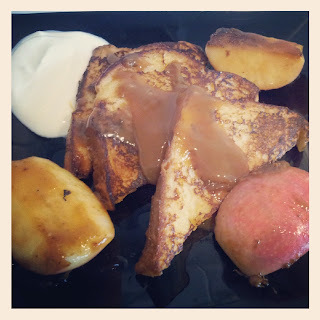 And I eschewed the dollop of softly whipped double cream in favour of a dollop of Greek yogurt, thus saving a few calories and also helping to cut through the tooth-rotting sweetness that is basically toffee apples on sweet French Toast. Miss A had one triangle of toast with a smear of the toffee and a freshly sliced apple but managed to swipe a second bit of the bread and ram it in her mouth before I knew where it had gone. I've tried her with French toast before but she's always turned her nose up at it. I think the brioche version - sans toffee sauce - might make a good compromise in future. The brioche I used was a pre-bought, ready sliced one which is pretty lazy of me, but it's a great way to use up the end of a left over loaf whether you make your own or not. It's something I've done before on this blog (read the post here) and it was a bit of an epically long recipe so not something I do regularly - but worth it for the treat. I do also want to try Dan Lepard's brioche recipe on day - and that takes two days of baking! One cheat was to use Bonne Maman Dulche de Leche rather than making my own caramel sauce. Purely because I had a half open jar in the fridge and didn't have any double cream to hand. My finally change to the recipe was to not peel my apples and to use Pink Ladies, leaving the skin on to give a pretty contrast to all the brown of the toast and the toffee. The picture doesn't really do it justice, but they did look quite decorative. I really need to work on my food photography! Mix the egg, milk, 2 tsp of sugar and vanilla together in a shallow bowl. Heat half the butter in a frying pan. Once foaming, dip the brioche pieces in the egg mixture and fry until lightly browned on both sides. Put on a plate in the oven to keep warm. Coat the apple in the rest of the sugar. Put the remaining butter in the frying pan and turn the heat up. Toss the apples in the butter until the sugar starts to caramelise. Add in the toffee sauce and warm slightly then serve over the brioche, topped with some Greek yogurt, creme fraiche or whipped cream.